This is a chance to combine walking and driving into a learning experience. Sugarloaf Mountain stands alone on the Montgomery and Frederick County border. It is privately owned and managed by Stronghold, Inc. Visitors are welcome to hike, horseback ride, picnic, and study nature for free. Beautiful views of the surrounding area are available from the summit. Getting there will also be an interesting experience. Our suggested route is via White’s Ferry. A ferry has been operating at this location over 150 years. The ferry will take you back into time as the land on the Maryland side has remained unchanged for years. Maryland officials have been trying to keep this area rural while Virginia officials have been anxious to build a bridge crossing. Maryland commuters along Interstate 270 would like to have a short cut to Virginia’s technology corridor. Drive back via Interstate 270 to experience the current commute that these people face. Fortunately we don’t have to make the decision. 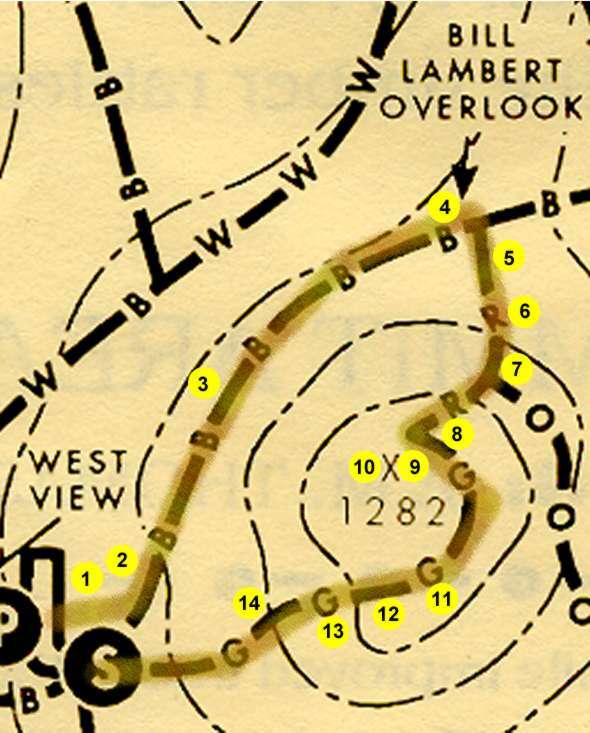 We have provided directions for a relatively short walk to the summit in the form of a loop. Most people take the green trail up and back. This involves climbing a large number of steps. Our route takes you to the north of the summit and up the red trail. It has less of a slope to climb than the steps although you will still be climbing about 300 feet. We then take you down the steps for the return loop. The walk starts at the west view parking lot. Park near the end of the lot prior to where it loops back. Walk up the stone steps shown in the picture. After a short walk up hill turn left onto the intersecting trail. This is the blue trail and is relatively flat in this section. A number of mountain laurel will be found on the sides of the trail. This would be a pretty place to visit in the spring. A marker is placed at the intersection with the red trail. You may wish to see the view from the overlook on the left. After that turn right to follow the red trail. The red trail climbs a steep rocky section. This only lasts for a short distance. The rocky section ends but the trail continues to climb the mountain. A marker indicates an intersection with the orange trail on the left. Continue straight on the red trail continuing to climb the mountain. A marker indicates the intersection with the green trail near the summit. Continue straight for the overlook. The group shown are getting instructions for rappelling down the stone cliffs on the mountain. This is a view of the PEPCO power plant on the Potomac River near Dickerson. Virginia lies on the other side of the river. The power plant is 5 miles away. Leesburg is about 13 miles away and slightly to the left of the power plant. Return to the marker in step 8 and follow the arrow for the green trail. After a short distance the trail comes to the stone steps shown. This is a view of the steps looking up. The steps are steep and narrow but have a good handrail. The steps change into a stone walk after some distance. This is the view of the trail near the parking area. This ends the short walk on Sugarloaf Mountain. There are numerous other hiking trails on the mountain at distances up to 7 miles. Stronghold has consented to publishing a copy of their maps on this site. It may take a minute to download because of its size. The same map is available at Sugarloaf Mountain thanks to the generosity of Stronghold, Inc. Click here to view a copy of the complete trail system.